I extracted this information from Fred Sahms off of the old Topica Loopframe_Guzzi news group (which has now moved to Yahoo!) AND from Key Men AND from Keys4Classics AND from the Moto Guzzi National Owners Club (MGNOC) publication Tips for Guzzis, Volume II AND from Charlie Mullendore of Antietam Classic Cycle, AND from Bill Dudley. The ignition switch was made by Magneti Marelli (Italian company). There will be a letter code followed by two numbers stamped on the switch. The letter code, usually E or F or G , indicates the key code blank that you'll need. 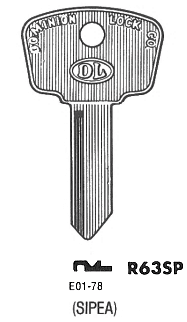 Ilco R63SP key blank. Note: The key pattern shown is the keyhole that the key goes into, not the view from the tip of the key. Photo courtesy of Key Men. The SILCA AF5A works equally well in the E series locks. Again, Keys4Classics out of Australia is a fantastic source. Ilco F91F key blank. 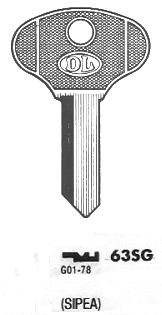 Note: The key pattern shown is the keyhole that the key goes into, not the view from the tip of the key. I finally sourced an original ignition switch for my Ambassador but it was missing the key. I ordered several replacements from Keys4Classics out of Australia. My lock is an F series and the key blanks that I received are SILCA AF5B. They work perfectly in my lock. FYI, Keys4Classsics did an excellent job of responding to my e-mails and shipping was inexpensive and prompt. First rate. Ilco F91G key blank. Note: The key pattern shown is the keyhole that the key goes into, not the view from the tip of the key. My local locksmith found an Ilco blank marked 1645R , which fits the lock perfectly. Ilco F91H key blank. Note: The key pattern shown is the keyhole that the key goes into, not the view from the tip of the key.